Croatia is not only blessed with ancient historical architecture, culture and breathtaking scenery but also with extraordinary nature. The National Parks offer unlimited recreational, relaxation and sightseeing opportunities. These are the places that are visited by millions of tourists every year. Birdwatchers can appreciate the vast wetlands and lakes that are situated in eastern Croatia. 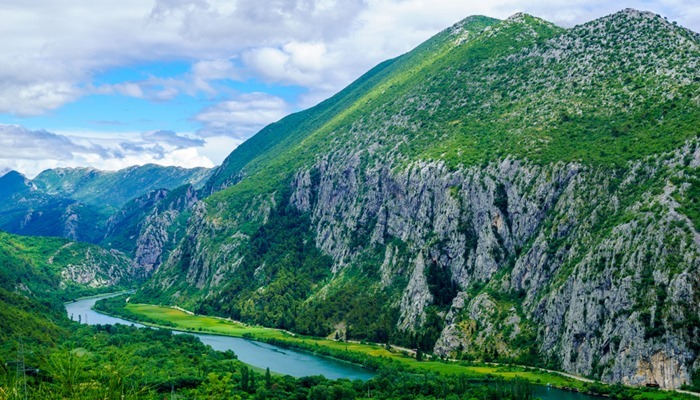 Active adventurers can enjoy water sports on the Cetina or Zrmanja rivers. 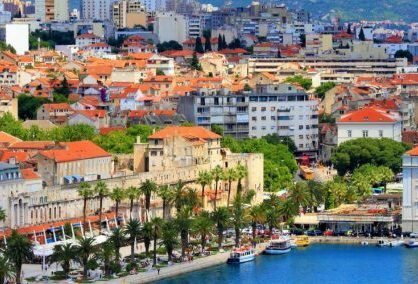 Our range of Croatia activity holidays caters well to these tastes. If you simply want to sit in peaceful solitude and savour the atmosphere and spectacular views, there are many magnificent mountains that overlook the Adriatic Sea and beautiful Croatian islands. One of the best ways to explore the coast is on one of our Croatia island cruises. 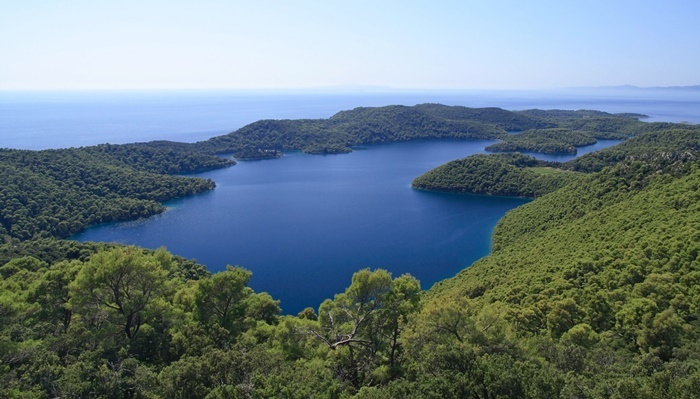 Mljet Island is an unspoiled oasis of natural beauty and tranquility. The island has an extensive pine forest and a National Park with two saltwater lakes. Some species of mussels grow on the pine branches that are immersed in the forest lakes. This photo is of St Mary’s island and her monastery which lies in the centre of the larger salt lake. Read a diary of the Mjlet leg of island-hopping in Croatia. Plitvice Lakes is a popular destination for nature lovers visiting Croatia. The natural attraction boasts 16 interconnected lakes that are continually fed by the magnificent collection of waterfalls. To explore the lakes, take a stroll along the wooden plank paths that wind around the stunning setting. The Drava River is one of the few remaining lowland rivers in Europe. The river’s ever flowing natural movement, combined with the weather, constantly recreates the steep banks, gravel and sand bars, oxbow lakes and flooded forests. The Danube flood plain of Kopački Rit boasts more than 17 hectares of reeds, sedges and flooded forests. It is home to an abundance of European wetland species including birds, deer, wild boars and otters. Mrežnica River features a spectacular display of a hundred waterfalls. The river runs through a forested canyon and stretches out more than 70 kilometres. This oasis is the perfect place to paddle or swim, or to relax and admire the beautiful cascading waterfalls. Velebit Mountain has an imposing appearance. Its location offers stunning views of the Adriatic Sea. The thousands of hectares of rocky grasslands, forests and craggy limestone rocks, of this mountainous area, are a nature park and a National Park. This is where wolves and other creatures hunt freely. To fully explore the magnificent nature of this hot spot, take a walk along the network of hiking trails. 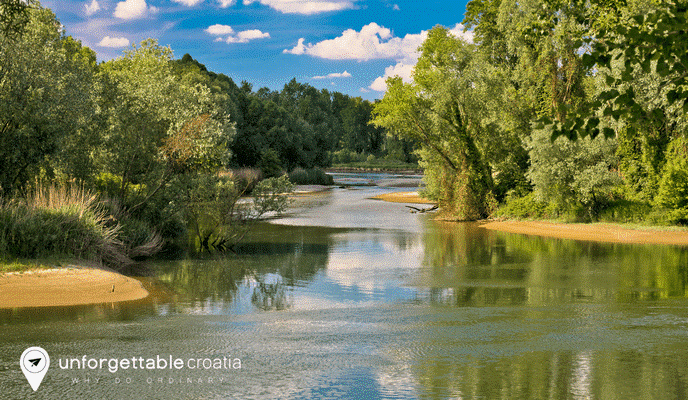 The Krupa River is a tributary of the Zrmanja River, and is just seven kilometres long. Although smaller in size than some of the popular nature attractions, the river is nestled in a huge rocky canyon and features impressive waterfalls. It’s also rich in fish. Gorski Kotar is a forest-clad mountain range that has a high density of lynx, wolves and bears. The natural area is also one of the most humid parts of Croatia, and is home to fragrant spruce and fir that revitalise the mind, body and spirit. The Telašćica Nature Park, on Dugi Otok Island, is a gorgeous natural harbour with an indented coastline. The uninhabited area is a popular destination for visitors on day excursions and sailors on yachts. Among the main attractions are the saltwater lake Mir, the tall cliffs, and the impressive bay. Located in an isolated area off the mainland coast is Lastovo Island. Due to its distance, the island has maintained many of its natural and cultural attractions. Many of the island’s treasures lay below the sea surface. The nearby islands of Bijelac and Sušac are also full of colourful corals and huge shoals of fish. Give our team of Croatia travel experts a call today on 020 8004 2345 with any questions. See two or more of Croatia’s natural beauty spots on a Croatia multi-centre holiday. 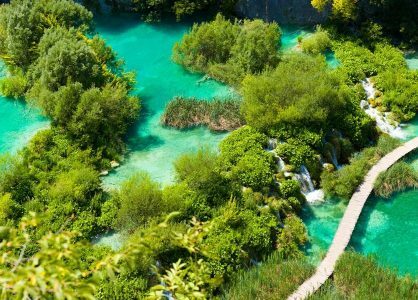 Often described as the most beautiful National Park in Eastern Europe, Plitvice Lakes is very much the stunning centrepiece gem of Croatia’s tapestry of attractions.